Everyone loves a fresh cup of coffee. But not all of us want to pay five bucks for each one! And when you’re out camping, you don’t have the luxury of high-tailing it to a local Starbucks to get your fix. That’s where a camping thermos comes in. Thermoses are incredibly versatile as they can keep your drinks as well as your foods warm or cold, depending on your preference. Coffee, though, coffee is a universal necessity for most of us who enjoy the great outdoors. Finding the best camping thermos for coffee can really make a huge difference when it comes to keeping yourself energized and ready to take on the world. Here we will outline our eight favorite camping thermoses and hopefully, you’ll get an idea of what the right thermos can do for you and your outdoor adventures! When deciding on any type of camping gear, you always have to determine what your intended use is. If you’re planning a short but strenuous hike, a lightweight, single-serving bottle will likely be a great choice for you. However, if you are going on a weekend-long (or even week-long) camping excursion, the more volume your thermos can hold, the better. Obviously, you want a thermos that can hold enough liquid to keep you hydrated without having to refill every few minutes. When you’re out camping, convenience is key and you won’t have time to be doubling back to your campsite after an hour of trekking. Luckily, the best thermoses can keep your water cold and your coffee hot for hours and hours so temperature consistency won’t come into play no matter what size your thermos is. Depending on how you plan on using your thermos, you can easily decide on a perfect model for you by taking into account the capacity it should hold. 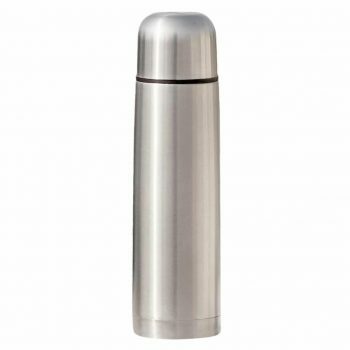 The most durable thermoses feature stainless steel construction on the interior and exterior. All of the bottles on our list are made with stainless steel, meaning they are strong and durable and can stand up to the kinds of wear and tear that are often encountered during trips in the outdoors. Stainless steel is also very easy to clean. The type of insulation a thermos has determines how long it will keep your liquids at their original temperature. Double-walled construction features an airless vacuum that prevents conduction and convection which cause heat loss. This insulation allows the liquids to stay very hot or cold for sometimes up to a day or more. Thermoses are more than just bottles that hold your drinks. In fact, the many features available can help you choose which thermos is right for you. Between lids, handles, and mouthpieces, there is a wide variety of bottles that add convenience to your camping trips. A wide-mouth bottle makes pouring easy when on the move during hiking or adventuring. The lip and mouthpieces also play a role in a thermos’s ability to prevent leaks and spills. Some thermoses have caps that unscrew and become cups, allowing you to save even more room packing for your trip. Handle attachments and carabiners make traveling with your thermos easier. When you’re hiking or camping, the more movement and agility you have, the better. So keeping your hands free by hooking your bottles to your pack or belt is an added bonus. Price is always a factor to consider no matter what you’re purchasing. Luckily with thermoses, you can get a great, affordable unit without breaking the bank! All of the coffee thermoses on this list can be purchased for between $10 and $40, and with the kind of use you will be getting out of your thermoses on the trails, it’s a very worthwhile investment. The Thermos Compact Bottle is an awesome choice for anyone who wants to stay hydrated and well fed while camping or hiking out on the trails. Thanks to the vacuum insulation technology, this thermos will keep hot coffee hot for up to 12 hours, plenty of time to enjoy a full day of camping or hiking. Cold drinks will stay cold for 24 hours, making this thermos perfect for cold water or other drinks that keep you hydrated on hot summer days. 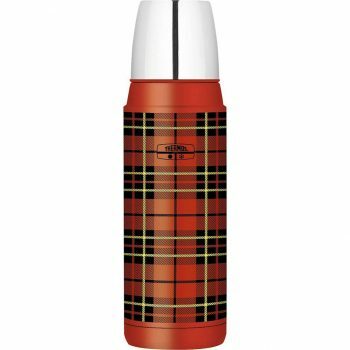 This specific thermos sports a grey plaid design as part of the Heritage Plaid series that retro lovers will adore. It also features Thermos’ durable stainless steel vacuum-insulated construction that keeps liquid at the desired temperature without changing for several hours. This thermos does not feature a straw or a pop-top to drink out of, but the unscrewable top doubles as a drinking cup so you can pack even less on your camping adventure. Keep in mind that this thermos is not dishwasher safe so it will need to be hand-washed to retain its durability. 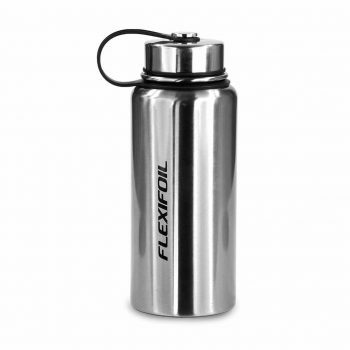 The Flexifoil Stainless Steel Thermos is a great large capacity carrier for liquids of all temperatures. This bottle features a hydro design with 24-hour thermo technology so you won’t have to worry about your cold drinks getting warm or your hot drinks getting cool for a full day at a time. A unique built-in ice mechanism can keep ice from melting, allowing drinks to stay cold for even longer. When you’re out camping or hiking, you don’t need one extra thing to worry about. The portable, compact design of this thermos allows it to fit inside a pack, purse, or another container for simple travel. It also features a handle and wide mouth for ease of use during treks outside or sporting events. The durable design gives users peace of mind during activities because it won’t easily show damage or wear and tear. Keep in mind that this bottle will not fit in conventional cup holders since it holds a much larger volume of liquid than other bottles. The Vibrant All in One Travel Mug is a unique option for those who love to spend time outdoors and stay hydrated at the same time. Yoga enthusiasts love this bottle because it includes a mesh utensil that can be used to steep tea and infuse water with fruit. This is a great way to take in antioxidants while camping and getting exercise outdoors. Fruit infused water also helps fill you up and keep you energized while sweating outside. The steeper is also perfect for making delicious iced coffee for added oomph during early morning hikes and treks. The unbreakable stainless steel interior and exterior design make this thermos extremely durable so it can stand up to whatever the great outdoors might throw your way. It is also BPA-free, meaning this bottle won’t leave a bad, metallic taste in your mouth. This bottle doesn’t feature a straw but the top can be unscrewed for easy drinking and pouring. The slim design will easily fit into a pack. Keep in mind that this bottle is not dishwasher safe. The YETI Rambler Tumbler is one of the most popular choices in thermoses. 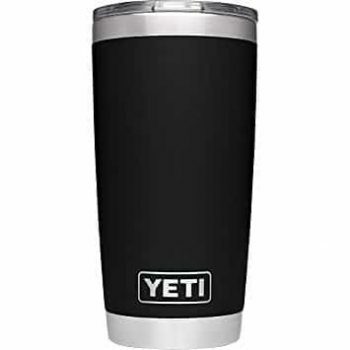 YETI is a name known all around due to its durability and double-wall vacuum insulation. This BPA-free bottle features 18/8 stainless steel body is puncture-resistant. It also won’t rust with continual use. It comes in five stylish colors including chrome, Tahoe Blue, Seafoam, Olive Green, and Black so you can really express yourself when out camping or during sporting events. Both the thermos and the lid are dishwasher safe and shatterproof. The lid is clear so you can easily check how much liquid you have left without unscrewing or opening anything. The No-Sweat design ensures that cold drinks won’t cause condensation to leak out of the bottle’s exterior. However, because the lid is not perfectly secure at all times and features an always-open drink hole, this tumbler can leak if spilled over. To combat this, a replacement lid with a strong seal can be purchased separately. YETI specifically designs their tumblers to fit in conventional cup holders so you won’t have to worry about them not fitting properly in the fold up chairs on your campsite. The Fijoo Stainless Steel Thermos is a wonderful choice for camping because it features an air tight lid and unscrewable thermos cap for drinking. This tightly sealed vacuum keeps the bottle even more insulated and paired with the double-wall insulation, your drinks will stay hot OR cold for hours. 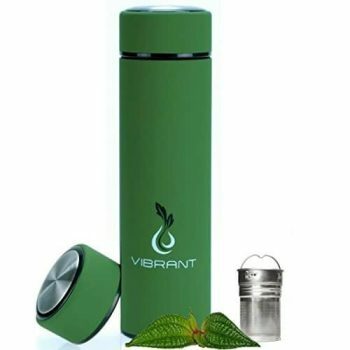 The cylindrical shape makes this thermos perfect for travel and camping because it takes up very little room and can be held comfortably during a hike or trek or even a bike ride. Because of the thermos cup, you won’t have to pack extra cups or bowls when traveling. The durable design prevents leaks and spills, and the stainless steel exterior keeps your drink from sweating. It will also keep your bottle safe from wear and tear during intense camps, hikes, or sporting events. This thermos is another BPA-free design so it won’t rust nor leave an aluminum taste in your mouth after taking sips. This bottle features absolutely no aluminum or plastic parts. 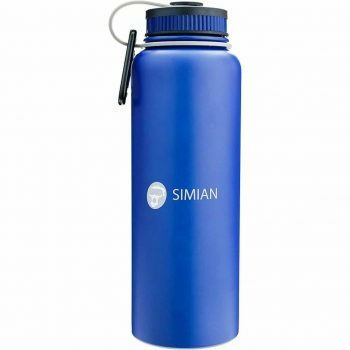 The Simian Insulated Water Bottle was designed to be an incredible thermos for camping enthusiasts. The attached carabiner makes it easy to attach this bottle to a belt loop or a backpack for hands-free camping and hiking. With a 40-ounce capacity, that is extremely helpful since it may otherwise be inconvenient to try and lug around. While attaching it to a bag, though, the large capacity means you can keep hydrated all day long while enjoying your outdoor excursions. The wide-mouth is perfect for this kind of large-capacity bottle. This sweat-free thermos is constructed with 100 percent food-safe stainless steel and is BPA-free. Three color choices are available for you to choose from including matte grey, blue, and green. The insulation on this bottle has been known to last a shorter amount of time and to be less durable as other thermoses on our list but this is still a great, affordable choice. 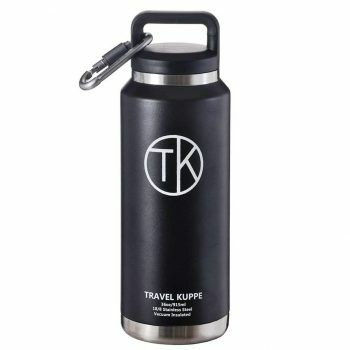 The Travel Kuppe Camper Bottle is another one of our favorite camping thermoses. This bottle has double-walled insulation which will keep your cold liquids cold for a staggering 48 hours, meaning you can pretty much make it through a whole camping weekend on one bottle of water if you needed to. However, you’ll likely need a lot more hydration than that when you’re out making moves on the trails and campsites. When it comes to hot drinks, this BPA-free, sweat-proof bottle ensures you won’t have to worry about heat transferring away from your liquids. That makes it perfect for keeping your morning coffee hot and fresh on your camping trips. The D-clip makes it easy for this bottle to be attached to a bag or pack. The wide mouth, over-the-nose makes it easy to chug your liquid while on hikes and treks in the great outdoors. This thermos comes in both a 36 ounce size as well as a smaller size if the large is too big. However, the large size is perfect for staying hydrated during strenuous activities. The Mixpresso Coffee Thermos is a fantastic, affordable option for liquid storage and hydration during outdoor activities like hiking and camping. Its small capacity and slim design make it incredibly lightweight and portable, taking up very little space in a bag or pack. Even though this thermos is cheaper than the others on this list, it still features a super effective, stainless steel insulation that will keep your foods and drinks cold or hot, respectively. This thermos is stain and damage resistant which makes it an excellent choice for camping trips. The covered mouthpiece is a unique feature that other, more expensive coffee thermoses don’t even have. Thanks to this mouthpiece, you won’t have to worry about spilling hot coffee on yourself which can cause burns and stains. You’re already spending time outside in the elements, why add unnecessary stains or injuries to the mix? The lid of this bottle also locks shut so it won’t leak when stuck in a pack or a portable cup holder. This bottle is very smooth and does not come with a means of attachment for hooking to a bag or pack, so be sure to handle this bottle with care. Because of its cheaper design, it does have parts that will break if put through heavy roughness. As you can see, not all thermoses are created equally. You shouldn’t have to sacrifice the comfort of a perfect, steaming cup of joe just because you’re spending the weekend outside camping! One thermos can do it all when it comes to camping. You can keep your coffee hot, your soup warm, and your water cold. Hydrating during a camping trip is one of the most important things you have to do, and you should always do it right. Now, after reading these eight reviews, you should have the knowledge you need to go out and choose the perfect coffee thermos for your needs. Let us know your thoughts in the comments!